HeatTech 240V mats are typically installed under tile and natural stone flooring, but are also suitable for laminate and even certain types of hardwood floors. 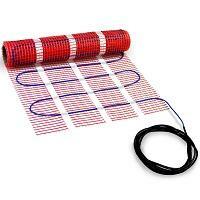 Each mat consists of a single heating wire adhered to a fiberglass mesh at even distance apart (3”). The mesh itself has adhesive backing, which helps the installer avoid repeat stapling or gluing of the mat when positioning it over the subfloor.